Virtuoso, the travel industry’s leading luxury network of elite travel specialists and travel providers, welcomes Raffles Praslin, Seychelles into its circle of exclusive hotels. This announcement follows a string of successes for the Indian Ocean resort, including recognition as one of the ‘10 Top Beach Resorts Around the World’, in the Forbes Travel Guide, and the World’s Leading Luxury Villa Resort at the World Travel Awards 2014. As a preferred hotel, this 86-villa resort, featuring some of the most spacious accommodation in the Seychelles, joins four other hotels within the FRHI Hotels & Resorts portfolio in the Middle East and Africa, including the Kenyan collection of Fairmont The Norfolk, Fairmont Mount Kenya Safari Club, Fairmont Mara Safari Club and the Raffles Dubai in the United Arab Emirates. 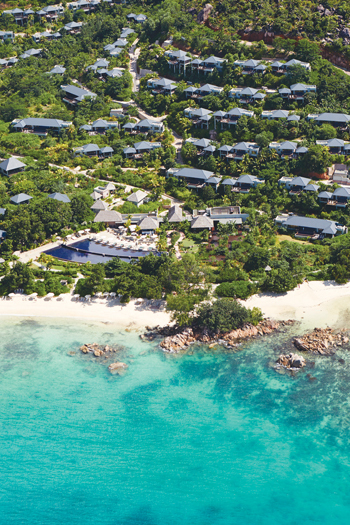 Raffles Praslin, Seychelles nestled in the Indian Ocean is a short 15 minute flight from the island of Mahé. Spread across gentle sloping hills, each villa and suite includes an outdoor pavilion, a private plunge pool and balcony affording breath-taking views of the ocean. The resort offers a choice of seven restaurants and lounges, including the only Shisha lounge in the Seychelles, and Raffles Spa with 13 treatment pavilions. Located on the North Coast of Praslin, the island is home to one of the best beaches in the world, Anse Lazio, as well as the Vallée de Mai, a Unesco World Heritage Site.